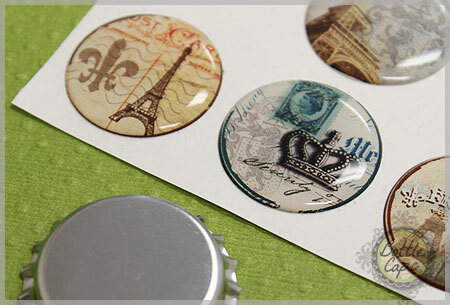 Have you been noticing bottle cap jewelry, keychains or fridge magnets lately? 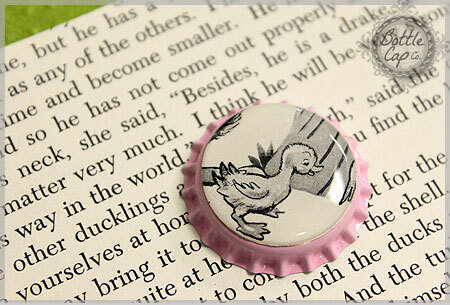 Are you wondering just how in the world bottle caps are used to create such unique handmade items?? Here's an article with lots of photos to inform and inspire you! 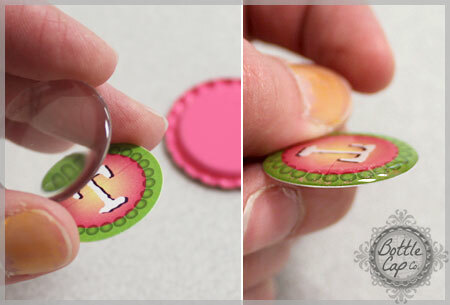 Learn how to create your own bottle cap necklaces, refrigerator magnets, handmade gifts, scrap embellishments and more. Bottle Caps, E6000 Glue, 1" Diameter Paper Punch, 1" Clear Epoxy Dots, any 1" circle design. But, there are lots of other options to help you get inspired also: old calendars, scrap book paper and embellishments, old children's books, dictionaries and magazines, stickers, cut out letters, children's art (especially for filling over size bottle caps). Just a thin coating of E6000 Glue or whatever adhesive you prefer. Bottle Cap Co. offers Premium Epoxy Dots and Standard Epoxy Dots. the USA. Standard dots will eventually yellow and harden and are made in China. 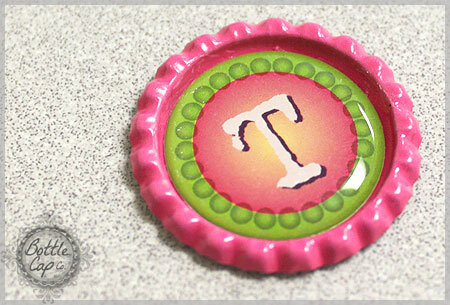 Bottle cap craft and jewelry items make great personalized handmade gifts. Add photos, inspirational sayings, team logos, family monograms, dates or any other content to make your bottle cap item a unique, thoughtful gift for someone you love. To me one of the coolest things about bottle caps is that they offer great fundraiser opportunities. 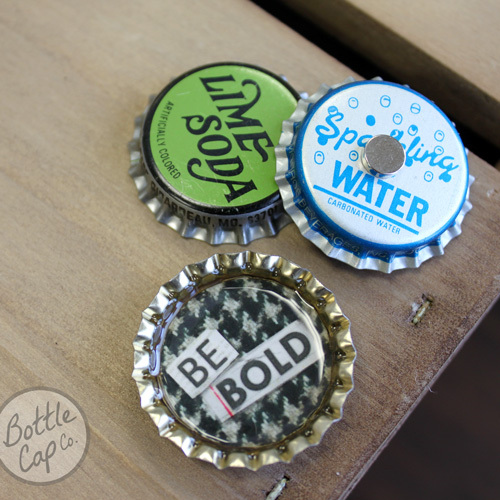 Bottle caps make quality, but inexpensive craft and jewelry items that can be sold for double, triple or even quadruple the cost of making them. Items like bottle cap necklaces, key chains, magnets, earrings and more are perfect for fundraising efforts and events or even as inexpensive giveaways to promote awareness for your cause. Call us if you need any help figuring out how to make bottle caps work for your next fundraiser. 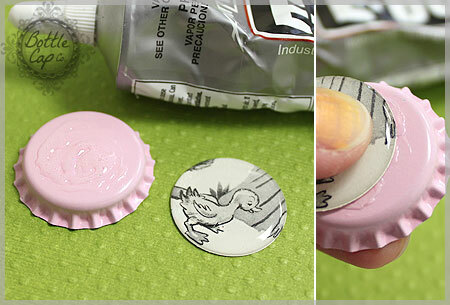 Apply a Thin Layer of Glue to the Top of the Cap. 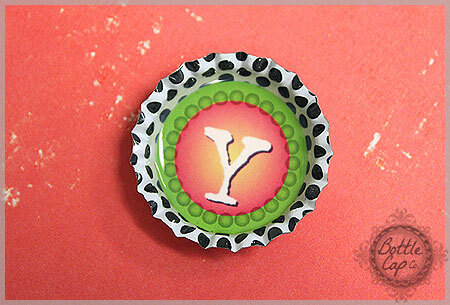 Press your design onto the cap (epoxy dot has already been adhered to the design). 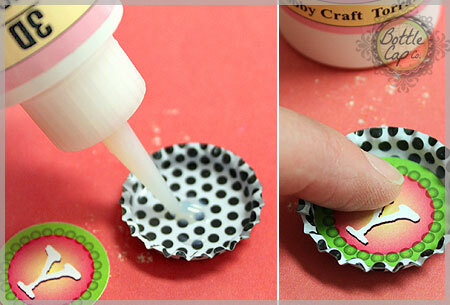 Move the design around the top of the cap until the glue is spread to all the edges of the cap and paper. As the glue dries and gets tackier press down on the edges of the design as shown here to form the epoxy dot to the very slight dome of the cap. If you want a clean seal to the cap you'll want to continue pressing the edges down over the next 5 or 10 minutes as the glue dries. The thinner the paper that your design is printed on, the quicker it will conform to the surface of the cap. *Don't worry if some glue is smeared on the sides, like I've shown above, after it dries it will be easy to rub off with your fingers. Make it into a key chain, necklace or bookmark for the beautiful girl in your life. If the design was on the inside of the cap it could also make a great bottle cap magnet for a shabby chic or vintage looking message board. Or if used as a necklace or key chain the inside design could include an inspirational saying or a photo! Pick your sticker. Pick your bottle cap. So much fun to mix and match! 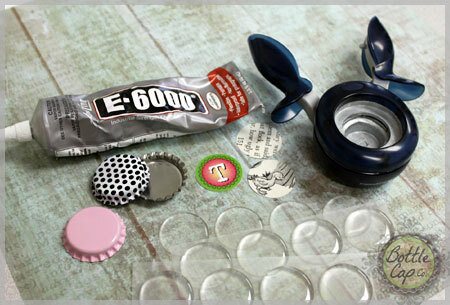 Browse Bottle Cap Co's Epoxy Sticker Sets to simplify your craft time even more. 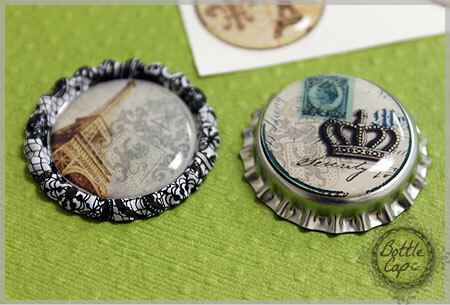 -Flattened black and white lace pattern bottle cap (left), chrome bottle cap (right). 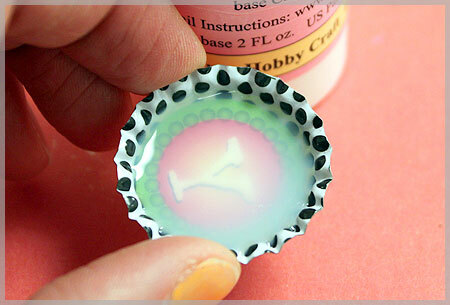 Use 3D Crystal Lacquer underneath the design to glue it in the cap. Then use a thin layer on top of the design to glue in the cabochon. It will dry clear! 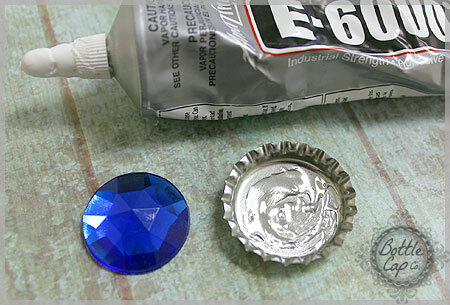 A 1" Saphire Acrylic Gem in a chrome bottle cap is shown above and below. 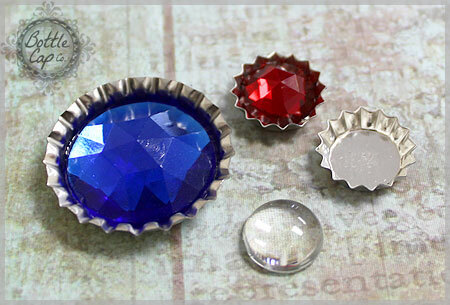 Acrylic Gems and Cabochons come in 1" and 1/2" sizes to fit perfectly in standard bottle caps and mini bottle caps. SPARKLE for your bottle cap jewelry, keychains, charms, flip flops, flower centers, hair bows and more! 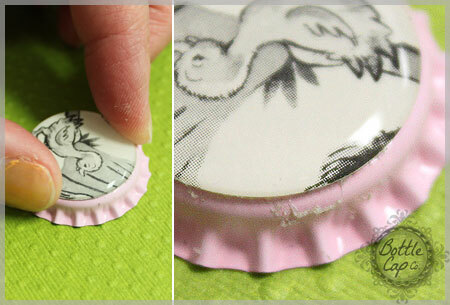 Glue the image to the cap with 3D Crystal Lacquer. If you don't glue the image down first it will most likely float to the top after you fill the cap. Flood the cap with 3D Crystal Lacquer. Tilt cap from side to side until the surface of the design is covered evenly. The thicker the application the longer it takes to dry completely. A thin layer will dry within 30 minutes to an hour. If you were to completely flood the cap 24 hours is usually enough but it may take up to 3 days to dry completely depending on the climate. WATCH OUT FOR BUBBLES! Pop any bubbles that appear as the Lacquer dries with a pin or even a toothpick. 3D Crystal Lacquer dries completely clear. It is water based so although it dries hard and clear it is NOT waterproof. Would you like your designs to include some 3D items like charms, buttons or scrap embellishments? Use 3D Crystal Lacquer to seal them up. Again, watch for bubbles as the Lacquer dries. Do you sell the polka dot bottle cap that is in the last picture? Yes it's part of the an assortment of black and white patterns. You can see it here: http://www.bottlecapco.com/Two-Sided-White-Bottle-Caps-with-Black-Patterns-Assortment_p_633.html Thanks for asking! Is there a trick to getting the epoxy dots off and on your project with out getting finger prints on them? Silly question. Hi Tammy! Which epoxy dots are you using? Usually they come off easily like a sticker. You could try tweezers? Why do my digital images look cloudy after covering them with an epoxy dot? 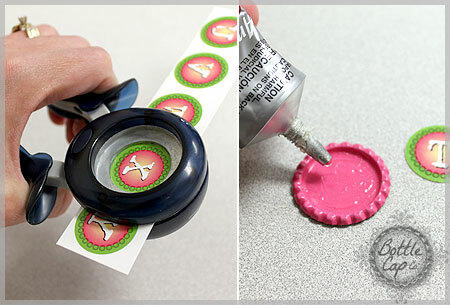 I have tried this project and I have the same glue, dots, and caps but everytime I glue the project to the cap it gets ruined. When it dries there is a spot where the glue went through the paper and ruined the deisgn. Is there a perticular paper I need to use or any suggestions to fix this? WHAT TYPE OF GLUE DO I USE TO GLUE PICTURES TO THE FLATTENED BOTTLECAPS? USED TACKY GLUE BUT THE PICTURES FALL OFF. Hi Linda, We definitely recommend using E-6000 glue which can be found right here on our site. This glue is a very strong hold and works very well with any of our bottle caps! Thank you for the question Ashley. I would definitely recommend glossy photo paper when printing your own images if you would like your image to look as clear as possible. Matte papers sometimes have texture or fibers in the surface which keep the dots from adhering completely to the surface. Hello! What is the trick to not seeing the adhesive from the epoxy sticker on the image? Emily, The adhesive is clear and shouldn't cause you any problems. Hi i was wondering if these with the epoxy dome are water proof thanks for your time!! Cassie, they aren't water proof. Water resistant, probably, but not water proof. I have a question. I have an old program that does not come with 1" inch round templates. Can you please tell me what you use to print out your round images. I need to up date my software and would love to know. Thank you. Hello Michelle! We use Adobe Photoshop and Illustrator to create our designs. Thanks for the question! Erica, we can't guarantee that they would be waterproof, but your best bet would be to seal the image using 3D Crystal Lacquer. 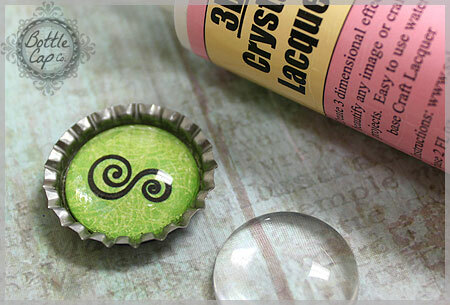 See the example towards the bottom of the page titled "Seal Your Bottle Cap Design with 3D Crystal Lacquer." Hello! I'm curious how to rid the bottlecaps of the smell of the epoxy glue!! Does it just take time? Or is there a faster way. It's very strong!! Hi... Could you please tell me the steps to turn a 4/6 photo into one I can use for the bottle cap using Photoshop? It would be greatly appreciated! Thanks!! Stacia, just leave them in a space where they can breathe and have a chance to air out is the only thing I can think to do. Stephanie, call our number (1-800-640-9978) and ask for Wende. She can walk you through the process. Hi. 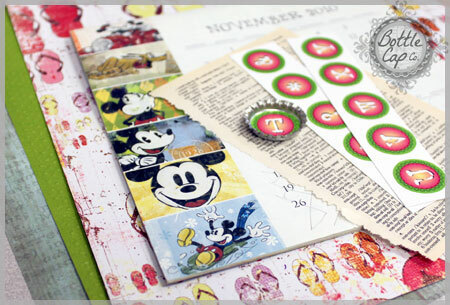 I cut my 1" circles from scrapbooking paper from Michael's and attached epoxy stickers to each. Then I glued them to the inside of the bottle caps using e6000 and other caps using mod podge. Both glues are seeping through the paper. How can I solve that problem? Thanks. Donna, we’ve glued lots of images in bottle caps with E6000 and haven’t had this problem, unless we use a lot of glue or every once in a while if the paper is pretty thin. I would recommend using E6000 and using less glue. The trick is to experiment until you get the right amount. Less is more and definitely don’t let the glue seep over the edges, better not to let it get all the way to the edges and it will still be plenty strong. If it still seeps through you might need to find another glue. this is a dum question but can I print this page out for myself? Rena, I just sent you thins blog post as a Word document. thank-you so very much, at least I know now what is going on, thanks again! Will this work on a photo that was printed on copy paper? Or does it need to be glossy photo paper? Crystal, For best results you will want to use glossy photo paper. If you wait too long to pop the bubbles the surface has started to harden and the bubble(s) can stubbornly move around the needle. My best idea is to tap the bottle cap lightly on the table top immediately after filling the cap with the 3D Crystal Lacquer. This will bring the bubbles to the surface and then “in our experience” they pop with a needle or toothpick. Randomly a bubble might surface after a few minutes so make sure to check the cap a couple minutes after the first round. It is best to make sure that your bottle of 3d Crystal Lacquer has been resting without being moved around much for a while before filling your bottle caps. That way air bubbles are decreased even before filling the cap. You can brush mod podge over a paper image to seal and protect the design. However, just like 3D Crystal Lacquer it is water based so it does NOT make the design waterproof only adds a protective coating. With Mod Podge it has to be applied layer by layer as it dries. It does not work to fill the cap. With 3D Crystal Lacquer you can fill the cap or apply a thick coating but with Mod Podge you cannot. Also, if the image was produced on an ink jet printer it is highly likely that the image will blur or fade. It is best to use an image that was copied on a laser copier or printed on a laser printer. Hi! I am wondering if I could substitute the epoxy dome for a glass dome. If so, what type of glue should I use? Thanks! My advice would be not to add tape to the top of the photo before putting the sticker on. Also, the Epoxy Dots work best when photos are printed on glossy paper. If there is any texture to the paper that she has printed the photos on that might be what is causing the “shine”. Our Premium Epoxy Dots are the best way to go if you are wanting a higher quality end result. I was wondering how you keep the edges from being so sharp. They can scratch surfaces and skin. I have gotten some scratching on my frig. Thanks. I tried making these last night and my glue soaked thru my paper images. What am I doing wrong? I'm using bottle caps for scrapbooking. Once I put the picture inside the cap, I need to know what glue to use to glue it onto the paper page. Where did you get your 1inch hole punch?